Biotinidase is a ubiquitous mammalian cell enzyme occurring in liver, serum and kidney. It cleaves biotin from biocytin, which is a cofactor for biotin dependent enzymes, namely the human carboxylases. Biotinidase deficiency is associated with a wide spectrum of neurological, dermatological, immunological and ophthalmological abnormalities. This is a case of a 3-year-old boy presenting with delayed developmental milestones, tachypnea, progressively increasing ataxia, alopecia and dermatitis, all which dramatically responded to high doses of biotin. Biotinidase deficiency results in functional deficiency of Carboxylase enzymes culminating in a wide array of dermatologic and systemic manifestations. Biotin serves as a cofactor for the four human carboxylases-pyruvate carboxylase, propionyl-coenzyme A (CoA) carboxylase, beta-methylcrotonyl-CoA carboxylase and acetyl-CoA carboxylase. These function in fatty acid synthesis, amino acid catabolism and gluconeogenesis. Enzyme Biotinidase cleaves biotin from biocytin, thus preserving the pool of biotin for use as a cofactor for these biotin dependent carboxylases. Biotinidase absence or deficiency impairs this step causing a deficiency of free biotin resulting in a spectrum of neurological, dermatological and metabolic abnormalities. A 3-year-old boy presented with global delay in developmental milestones, deep and rapid respiration and diffuses thinning of scalp hair since 6 months of age. He was born after an uneventful pregnancy and delivery as the first child of healthy unrelated parents. Birth weight was 2800 g and length 51 cm. He was breast-fed and had no problems until 6 months of age after which he started having rapid respiration and diffuse thinning of scalp hair with coarsening of skin texture. He also had a history of three episodes of generalized tonic-clonic convulsions in the past 2 years, but was not prescribed any long-term anticonvulsants. There was also history of recurrent ear discharge along with recurrent chest infections in the past. The younger sibling was normal. On examination, he was afebrile, with a respiratory rate of 72/min and pulse rate was 96/min. His head circumference, height and weight were between 50 th and 70 th percentiles on the growth charts. There was diffuse alopecia, seborrheic dermatitis and perioral desquamating lesions [Figure 1]. Bilateral Babinski was positive, jerks were brisk (grade 3) in all four limbs. He had learned to sit and stand, but walked with a broad based ataxic gait. His speech was slurred and indistinct. Other system examination was normal. Investigations revealed a normal hemogram, Chest X-ray, electroencephalogram and computed tomography scan of the head were normal. The random blood sugar and electrolytes were normal (serum sodium = 135 meq/L and potassium = 3.3 meq/L). Plasma ammonia was also normal. However, the arterial blood gas analysis revealed a picture of compensated metabolic acidosis with a pH of 7.482, PCO 2 = 15 mmHg, HCO 3 = 11.2 mmol/L and base deficit of - 12 mmol/L [Figure 2]. 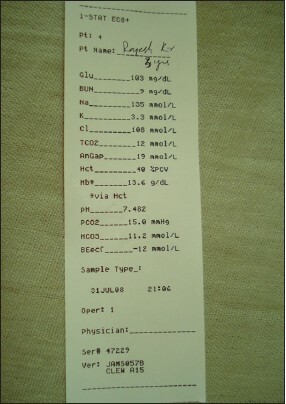 Serum lactate level was high. Liver function tests and serum urea and creatinine were within normal limits. Serum biotinidase level was low (value of 2 compared with normal of 5). The child was prescribed high doses of biotin (30 mg/day). During the subsequent week of hospital stay, his respiratory rate came down to 32/min. Follow-up after 6 weeks revealed a dramatic improvement with a thick crop of dark black hair replacing the diffusely alopecic scalp [Figure 3]. 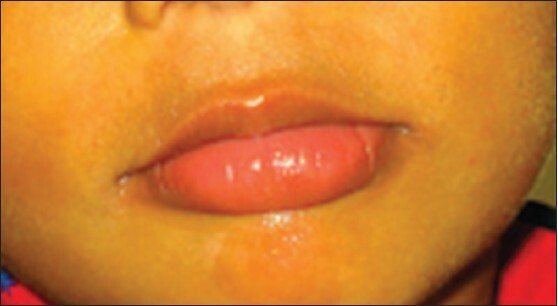 His perioral lesions had disappeared and skin had a much smooth, glossy texture [Figure 4]. His speech and gait had much improved and he could walk steadily without falling. There were no further convulsions. Blood gas analysis also was normal. Holocarboxylase deficiency has early onset (infantile form) in the newborn period. Infants become symptomatic in first few weeks of life. They present with tachypnea, feeding difficulties, hypotonia, generalized eczematous rash with exfoliation and alopecia (partial or total), failure to thrive and seizures. They are usually catastrophically ill with severe metabolic acidosis, lactic acidosis and may go into a coma. Diagnosis is from enzyme assay from lymphocytes or cultured fibroblasts. The present case under discussion had onset of the disease at 6 months of age and had diffuse alopecia, seborrheic dermatitis, ataxia and seizures. The dramatic improvement with high dose biotin, with catching up of the normal milestones, disappearance of dermatitis and perioral lesions, appearance of thick crop of hair and normalization of respiratory rate and arterial blood gases all favoured the diagnosis of the late onset form of multiple carboxylase deficiency or Biotinidase deficiency. This case further corroborates that the administration of biotin is lifesaving and timely diagnosis and treatment of biotinidase deficiency can dramatically improve the development and quality-of-life of the child. 1. Berry GT. Inborn errors of carbohydrate, ammonia, aminoacid and organic acid metabolism. In: Taeusch HW, Ballard RA, Gleason CA, editors. Avery's Diseases of the Newborn. 8 th ed. Philadelphia: Saunders; 2005. p. 242-3. 2. Bender DA, Mayes PA. Vitamins and minerals. In: Murray RK, Granner DK, Mayes PA, Rodwell VW, editors. Harper's Illustrated Biochemistry. 26 th ed. Boston: McGraw Hill; 2003. p. 494. 3. Bartlett K, Ghneim HK, Stirk HJ, Wastell H. Enzyme studies in biotin-responsive disorders. J Inherit Metab Dis 1985;8 Suppl 1:46-52. 4. Rezvani I. Defects in metabolism of amino acids: Multiple carboxylase deficiencies (defects in utilization of biotin). In: Kliegman RM, Behrman RE, Jenson HB, Stanton BF, editors. Nelson Textbook of Pediatrics. 18 th ed., Vol. 1. Philadelphia: Saunders Elsevier; 2007. p. 542-3. 5. Diamantopoulos N, Painter MJ, Wolf B, Heard GS, Roe C. Biotinidase deficiency: Accumulation of lactate in the brain and response to physiologic doses of biotin. Neurology 1986;36:1107-9. 6. Wolf B, Grier RE, Allen RJ, Goodman SI, Kien CL, Parker WD, et al. Phenotypic variation in biotinidase deficiency. J Pediatr 1983;103:233-7. 7. Suchy SF, McVoy JS, Wolf B. Neurologic symptoms of biotinidase deficiency: Possible explanation. Neurology 1985;35:1510-1. Early and complete recovery of dermatological and systemic signs like resolution of alopecia, ataxia, achievement of normal milestones and cognitive abilities, normalization of blood pH and bicarbonate levels after high dose biotin suggest biotinidase deficiency. 1 Why screen newborns for profound and partial biotinidase deficiency?